The 74HC/HCT112 are high-speed Si-gate CMOS devices and are pin compatible with low power Schottky TTL (LSTTL). They are specified in compliance with JEDEC standard no. 7A. 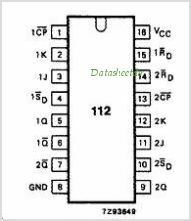 The 74HC/HCT112 are dual negative-edge triggered JK-type Flip-Flops featuring individual nJnKclock (nCP) set (nSD ) and reset (nRD ) inputs.,, The set and reset inputs, when LOW, set or reset the outputs as shown in the function table regardless of the levels at the other inputs.A HIGH level at the Clock (nCP) input enables the nJ and nK inputs and data will be accepted. The nJ and nK inputs control the state changes of the Flip-Flops as shown in the function table. The nJ and nK inputs must be stable one set-up time prior to the HIGH-to-LOW Clock transition for predictable operation. Output state changes are initiated by the HIGH-to-LOW transition of nCP. Schmitt-trigger action in the Clock input makes the circuit highly tolerant to slower Clock rise and fall times. This is one package pinout of 74HC-HCT112-CNV,If you need more pinouts please download 74HC-HCT112-CNV's pdf datasheet. 74HC-HCT112-CNV circuits will be updated soon..., now you can download the pdf datasheet to check the circuits!